Have a Plan. You should leave a general plan of your trip with family members or friends, as well as how they can best contact you. Passports. Make copies of your passport and leave them behind with someone you trust, as well as an electronic copy in your email for easy access. See the Doctor. Check with your doctor to see that you are A-OK to travel and re-fill any of your prescriptions you will need during your holiday. Insurance. Traveling is an adventure where anything can happen, but to be on the safe side check with your insurance to find out what kind of coverage you have and if you should consider finding a special travel package. Consulates. Before leaving it is a good idea to find the location and contact information for your national embassy in the country you will be traveling in. Be Open Minded. Traveling to another country is a thrilling experience and you will experience new things and different customs than what you are used to. Try to do some research about the culture and be prepared to embrace the diversity. Confirmations. It never hurts to check and then double check once more all your itineraries, flights, and tours with your Destination Expert. You and Columbus Travel both want your trip to go smoothly, so please don't hesitate to contact us! Peru is home to more than 30,000,000 citizens and is home to parts of the Amazon Rainforest, Pacific Coast, Andes Mountain Range and to one of the original 7 World Wonders, Machu Picchu. The country's capital is the city of Lima, located on the Coast with an estimated population of 8 million. The time zone of Peru is GMT -5. Officially, Spanish is the language spoken by about 80% of the population. 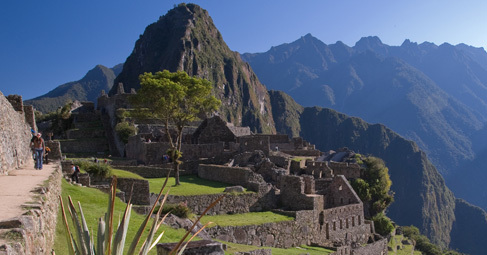 Quechua is spoken in the highlands as the main language for almost all indigenous people. Around Lake Titicaca the indigenous of this area speak Aymara. The indigenous people who live in the Amazon area speak many different dialects. On the Coast the December to April months are the warmest, sunniest months and it seldom rains. The wettest months are from June to August. Lightweight clothes are needed from October to May. In the highlands, the driest months are June to October. Day temperatures range from the high 60ºF/15ºc to the low 70ºF/20ºC, and in the 40ºF/4ºC and 50ºF/10ºC at night. A sweater, jacket and long pants are necessary. Rainwear is needed from December to March since it is rainy season in the highlands. In the Amazon Basin, the average temperature is 80ºC/27ºC. Rainfall is most intense from June to November. Clothing requirements are the same all year: light, tropical clothes, long pants and long sleeved shirts for jungle outings. Most major hotels will have 110-volt outlets. Although tap water is safe and potable, we suggest using bottled water anyways. Depending on where in Peru you will be traveling, it is best to consult your doctor to see if you should get any vaccines regarding yellow fever in the Amazonian areas. Definitely need to have a valid passport with you. If you can, keep a colored copy and your original Passport in two different places in case you lose one or the other. Visas are required for citizens of certain countries.